Take a break from Male with a short trip to Walking tours in Hulhumale, about 52 minutes away. And it doesn't end there: examine the collection at National Museum, browse the eclectic array of goods at Male Fish Market, appreciate the history behind Tsunami Monument, and contemplate in the serene atmosphere at Grand Friday Mosque. For reviews, ratings, other places to visit, and more tourist information, you can read our Male vacation planner. Philadelphia, USA to Male is an approximately 26-hour flight. Due to the time zone difference, you'll lose 10 hours traveling from Philadelphia to Male. Traveling from Philadelphia in June, you can expect nighttime temperatures to be somewhat warmer in Male, with lows of 81°F. Finish up your sightseeing early on the 24th (Sun) so you can travel to Southern Ari Atoll. Southern Ari Atoll contains the most populous of Ari's islands, though this still amounts to little. On the 24th (Sun), see some colorful creatures with a scuba or snorkeling tour. For maps, traveler tips, and other tourist information, refer to the Southern Ari Atoll itinerary builder. You can do a combination of ferry and flight from Male to Southern Ari Atoll in 2.5 hours. In June in Southern Ari Atoll, expect temperatures between 88°F during the day and 81°F at night. 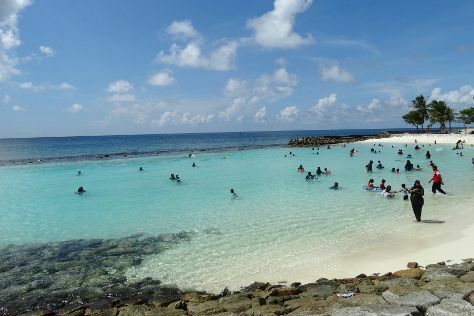 Finish your sightseeing early on the 25th (Mon) to allow enough time to fly to Maafushi Island. Kick off your visit on the 25th (Mon): see some colorful creatures with a scuba or snorkeling tour. To see traveler tips, reviews, photos, and tourist information, refer to the Maafushi Island tour planner. Fly from Southern Ari Atoll to Maafushi Island in 2 hours. Expect a daytime high around 88°F in June, and nighttime lows around 81°F. Wrap up your sightseeing on the 25th (Mon) to allow time to travel back home.